So, you’re ready to install that outdoor antenna. (Although southern Michigan isn’t one of them, there are plenty of parts of the country where people get up on the roof safely in December.) Before you get up on the roof, though, there are a few things you want to consider. We’ll take you on a quick ride through all the things you’ll need to know, and help you plan for perfect reception! Make sure you have the tools you need and the supplies. Do you have enough cable? What about grounding supplies? Your local city hall is usually a good place to find grounding ordinances, because they do vary. Do you have a mast? Most antennas don’t come with one. Your Solid Signal team can help you get everything you need. Make sure you have all the safety supplies you need. This includes a good sturdy ladder that’s rated for your actual weight (not what you tell people you weigh.) Get good strong boots because you don’t know if there could be stray nails up there and tetanus is… a bummer. Get good strong leather gloves and a pouch to hold the stray parts if you need both hands. Collect your tools. It will definitely ruin your day if you have to go up and down the ladder multiple times. Bring a couple of screwdrivers, an adjustable wrench or two, and if you are making your own cable, bring plenty of extra connectors. If you don’t use them, you can bring them back down. Don’t forget a level and a plumb bob. Technically, an antenna doesn’t have to be perfectly level to work, but they do look so much better that way. Also pack extra zip ties in your pockets, you’ll be surprised how much they will come in handy. Ready? Steady? Go! Once you get up on the roof, be prepared to spend some time up there. If you have a signal finder, use that to point the antenna. If not, be prepared with a printout from your favorite site like TVFool or antennaweb and a compass. It’s best if you have a small portable TV, they are easily found at low prices and they can help you really understand what your signal is going to be like. Need a rotator or preamp? You’ll need special cable. Solid Signal sells special cable with rotator wire attached, or you can run a second cable if you have existing cable in place. If you’re running a preamp, you’ll need cable with a solid copper center conductor so the power can run up it effectively. Things still not working? Here’s where your two most important tools come in handy… a cell phone and a partner. Someone else on the ground can check picture quality, tighten connections, and will be there if you make a mistake or fall down. Don’t try this sort of thing when you’re all alone unless you’re really comfortable doing it. Seriously, dude, don’t forget to ground it. Good grounding won’t help you get better reception, but think about this for a second. You are literally putting a piece of metal designed to conduct electricity, as high up on the roof as possible. There isn’t much you can do to hide from a lightning strike, but proper grounding will help protect your home, and it’s so easy to do in most cities and towns. It’s just not worth skipping this step. 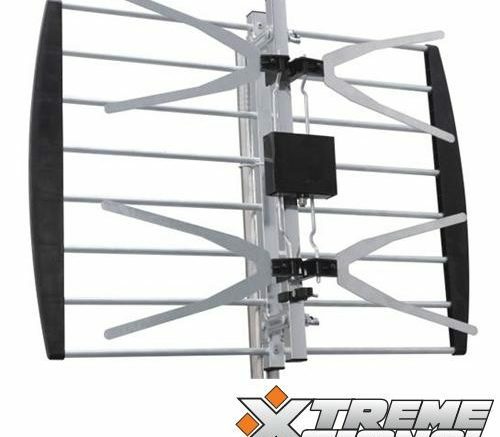 Installing an antenna can be a very fun experience and when you’re done you’ll have dozens of channels of free TV… but think about it, think hard, then get the job done properly the first time. What is multipath and what can I do about it?